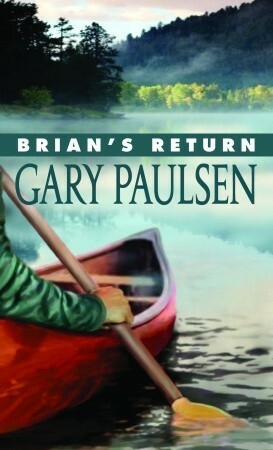 I picked this one up out of curiosity, to see how Mr. Paulsen got Brian back to the wilderness. (Besides, it's short and a quick read.) You can see from my previous Goodreads reviews that this series has been hit and miss for me. Brian's Return, the fourth installment of the saga, was mostly a hit. After his extended period of time alone in the wilderness, Brian has a hard time readjusting to "real life," even after being back for more than a year. In what would undoubtedly be diagnosed today as a reaction triggered by post-traumatic stress disorder, Brian seriously injures another teenage boy, Carl, who makes the mistake of swinging a fist at him after hurting two of Brian's friends. Brian's instincts take over. In that instant Brian totally reverted. He was no longer a boy walking into a pizza parlor. He was Brian back in the woods, Brian with the moose, Brian being attacked--Brian living because he was quick and focused and intent on staying alive--and Carl was the threat, the thing that had to be stopped, attacked. Destroyed. As a result of the attack, Brian starts seeing a counselor, Caleb, a seven-foot-tall, blind retired cop, who gets Brian to articulate the beauty he found in the woods and his longing to return and to reconnect with the person he was in the wilderness. Finally, one day Caleb "sighed and said, 'It's time for you to go back, to find what you're looking for.'" Brian "had to know what it was that pulled him and made him feel empty." Caleb helps to convince his parents, Brian makes the arrangements to visit the Cree family who found him, and he's off, back to the woods he so desperately misses. Of course, the woods have to re-teach Brian a few lessons he had forgotten. The first day, a deer leaps into his canoe, capsizing it and sending all his gear into the lake - fortunately nothing is damaged. The next night, a storm hits. The wind collapses his tent, which he hadn't secured, and sends it tumbling down the embankment with Brian still in it, knocking him out. He had forgotten the most important thing about living in the wilderness, the one thing he'd thought he would never forget--expect the unexpected. What you didn't think would get you, would get you. Plan on the worst and be happy when it didn't come. Brian, however, quickly re-learns these lessons and finds a peace in the woods that escaped him back in civilization, deciding to continue exploring on his own for a while instead of heading directly for the Cree family. I would have liked to read about more of his adventures, but this is where Paulsen decided to close the story. Paulsen's "Author's Note" at the end provides interesting insights into how Paulsen drew from his own experiences to write Brian's stories, including his ongoing search for solitude and wilderness over his lifetime. The Brian Saga is practically a love note to the wilderness. The way Paulsen describes what Brian sees, hears, feels, and does, it's evident that it is close to his heart.